Ben has been asking for an iPod. He is five. But he calls it a "music pocket". All toddlers love to dance to music. With no inhibition, they hear a beat and they start wobbling around, bobbing their heads. It's one of the sweetest things you'll ever see. But most of them grow out of it. Benjamin really hasn't. He will dance to jingles on ads, the ice cream truck, or the theme songs to T.V. shows. In the car where dancing is far more restricted due to the seat belt, he'll tap out complicated rhythms on the door, the window, the back of the driver's seat, for as many minutes or hours that we're driving. He's like our own Billy Elliot. Ben received enough gift cards for Christmas that we could get him the iPod Shuffle, which would be small enough to fit in his tiny jean pockets. Everywhere we go, he sees young people (not quite as young as Ben) listening to their MP3 players and the intense longing on his face and his feeling that he's missing out on hearing some really great song is just almost too much for me to handle! So what do we do? I don't think I even had my own radio until I was ten, and certainly not my own CD player until I was married! Even worse, I just barely got my own iPod about six months ago. Michael, however, is an early adopter who gets every latest piece of technology the second it comes out (or at least he wants to, our financial situation prohibits getting every latest thing) so he would have been the kindergartner with the iPod, if his parents would have let him. And then the next question will be... should we get one for Nathan as well? I don't think Nathan would take as good care of it, or even listen to it much after the original thrill wore off, so I'm leaning towards no. 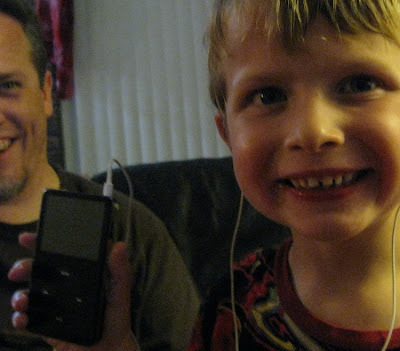 My friend Selena got her five year old son an MP3 player just recently. And she also just shared that yesterday one of her third grade students had their cell phone go off in class! A few months back, Nathan borrowed a friend's cell phone to call home and I could barely get past the shock of having my then seven year old call me. How young is too young for all this technology? I don't want to be a dinosaur of a parent... it's not like he's asking for a facial piercing or tattoos here. Watch out, the Chase Family has just entered brand new, previously uncharted territory! Naomi's been asking for a cell phone. Um, no. For us..the MP3 player was a good idea. Car rides are much quieter and Seth absolutely loves music! He's done an excellent job at keeping it away from the younger brothers but will share with Evan on occasion. However, in our defense...we did not buy him and Ipod because we didn't want to spend a lot of money on something we weren't sure of how it would be taken care of. A cell phone though...that's another story. I do not see why my students need a cell phone.